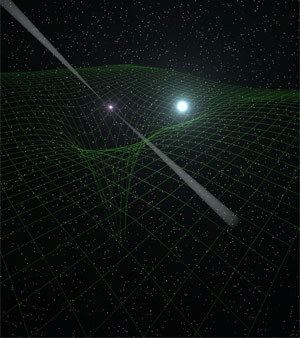 Superdense neutron star, emitting beams of radio waves as a pulsar, center, is closely paired with a compact white-dwarf star. Together, the two provide physicists with an unprecedented natural, cosmic “laboratory” for studying the nature of gravity. The grid background illustrates the distortions of spacetime caused by the gravitational effect of the two objects. Credit: Antoniadis, et al. Observations of a newly discovered pulsar and its white dwarf companion, orbiting each other once every two and a half hours, show that the binary’s orbital decay is consistent with Einstein’s Theory of General Relativity. A strange stellar pair nearly 7,000 light-years from Earth has provided physicists with a unique cosmic laboratory for studying the nature of gravity. The extremely strong gravity of a massive neutron star in orbit with a companion white dwarf star puts competing theories of gravity to a test more stringent than any available before. Once again, Albert Einstein’s General Theory of Relativity, published in 1915, comes out on top. At some point, however, scientists expect Einstein’s model to be invalid under extreme conditions. General Relativity, for example, is incompatible with quantum theory. Physicists hope to find an alternate description of gravity that would eliminate that incompatibility. The tightly-orbiting pair was discovered with the National Science Foundation’s Green Bank Telescope (GBT), and subsequently studied in visible light with the Apache Point telescope in New Mexico, the Very Large Telescope in Chile, and the William Herschel Telescope in the Canary Islands. Extensive radio observations with the Arecibo telescope in Puerto Rico and the Effelsberg telescope in Germany yielded vital data on subtle changes in the pair’s orbit. “We thought this system might be extreme enough to show a breakdown in General Relativity, but instead, Einstein’s predictions held up quite well,” said Paulo Freire, of the Max Planck Institute for Radioastronomy in Germany. That’s good news, the scientists say, for researchers hoping to make the first direct detection of gravitational waves with advanced instruments. Researchers using such instruments hope to detect the gravitational waves emitted as such dense pairs as neutron stars and black holes spiral inward toward violent collisions. Gravitational waves are extremely difficult to detect and even with the best instruments, physicists expect they will need to know the characteristics of the waves they seek, which will be buried in “noise” from their detectors. Knowing the characteristics of the waves they seek will allow them to extract the signal they seek from that noise. “Our results indicate that the filtering techniques planned for these advanced instruments remain valid,” said Ryan Lynch, of McGill University. Be the first to comment on "Observations of a Pulsar and Its White Dwarf Companion Back General Theory of Relativity"